"I call upon thee Avary (A-vury). That with the East ye shalt guard me and mine. Bind thyself to this place"
"O, Hailec (Hay-lek) come to me this day, the powers of the South to stay. Bind thyself to this place"
Now sit upon the earth and close your eyes. 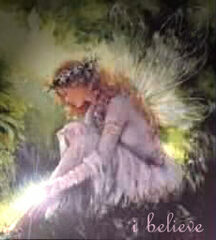 Feel the presence of the Faerie folk - bid them tend your garden well, and with a heartfelt thank you, depart. Another way to enchant a garden or grove is to write runic blessings upon colored ribbons or strips of cloth (no synthetics, please). Pass them through incense smoke and anoint them with Oil to charge their words. Then tie them to the branches of the trees and bushes creating a rainbow of dancing colors. The beautiful fragrance and the bright hues are sure to attract the Faerie Folk. Be sure to include children when working Faerie Magick, or at least your own inner child!